Tree based on Freshwater et al. 1994, Pueschel 1994, Ragan et al. 1994, Saunders and Bailey 1997, and unpublished analyses of S. Fredericq, D.W. Freshwater, and M.H. Hommersand. The Florideophyceae is a well-defined assemblage of red algae that share a number of characters including the presence of tetrasporangia, and a filamentous gonimoblast. Some species are used directly by humans for food, while cell wall polysaccharides are extracted from others for use as gels, and additives in food and cosmetic products. Figure 1. Electron micrograph of a Cumagloia andersonii (Nemaliales) pit plug. 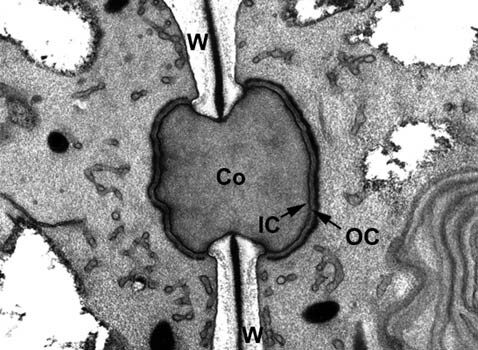 The pit plug occupies an aperture in the cell wall (W) and consists of a plug core (Co), flanked on either end by a thin inner cap layer (IC), and a plate-like outer cap layer (OC). Image copyright © 2000, C.M. Pueschel. Figure 2. 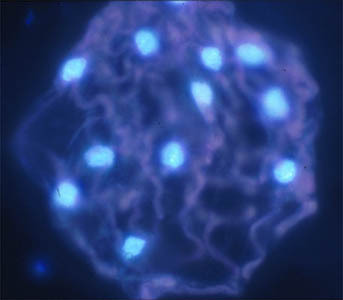 DAPI stained cell of Agardhiella subulata showing multiple brightly fluorescing nuclei. Image copyright © 2000, D.F. Kapraun. Figure 3. Diagram of triphasic life history. Haploid (1N) male gametophytes produce spermatia that are released, while haploid female gametophytes produce carpogonia (=egg cells) that are retained on the female gametophyte. After fertilization, the diploid (2N) zygote is still retained on the female gametophyte and develops into the diploid carposporophyte. The carposporophyte produces diploid carpospores that are released and develop into the diploid tetrasporophyte. The tetrasporophyte produces tetrasporangia where meiotic divisions result in haploid tetraspores. These tetraspores then develop into haploid gametophytes completing the life cycle. Image copyright © 2000, D. W. Freshwater. Hypothesized relationships in the Florideophyceae are in a state of flux. Traditionally, life history characteristics, and ontogeny of the female reproductive system and carposporophyte were used to study red algal relationships. Constraints on development imposed by the filamentous construction of florideophycean taxa have lead to convergent evolution in these characters. Interpretation of these characters is therefore difficult, and in turn has prevented the establishment of solid hypotheses for higher-level relationships in the Florideophyceae. Gabrielson and Garbary used cladistic methodology to analyze a data matrix of 35 red algal characters (Gabrielson and Garbary 1985, 1987, Garbary and Gabrielson 1990). Their resulting phylogenetic hypothesis suggested a progression from primitive (Acrochaetiales) to advanced (Ceramiales) lineages that corresponded to recognized orders. Four of the characters in Gabrielson and Garbary's data matrix involved the ultrastructure of pit connections, which Pueschel and Cole (1982) had previously demonstrated could be used to delineate red algal orders. Pueschel (1994) subsequently developed a phylogenetic hypothesis based on these characters. In this hypothesis florideophycean taxa with two pit plug caps form a monophyletic group, and within this group, having a domed outer cap is the ancestral state (versus having plate-like outer caps). Two overall analyses of red algae based on nucleotide sequence data from the nuclear encoded small ribosomal subunit (SSU) (Ragan et al. 1994), and the chloroplast encoded large subunit of RuBisCO (rbcL) (Freshwater et al. 1994) genes were published in 1994. While both analyses suffered from insufficient taxon sampling, they demonstrated the potential of sequence analyses for exploring the ordinal level relationships of red algae. More narrowly focused analyses of sequence data have been used to help define florideophycean orders (e.g. Fredericq et al. 1996, Saunders and Kraft 1994, 1996). Saunders and Bailey (1997) used an expanded analysis of SSU sequence data (70 taxa) to independently examine Pueschel's (1994) hypothesis of evolution based on pit connection characters, and the resulting tree provided strong support for this hypothesis. Other aspects of the Saunders and Bailey (1997) tree relating to florideophycean evolution are discussed in Saunders and Kraft (1997). More taxon replete analyses of both SSU and rbcL data are in progress and should result in a well-defined hypothesis of evolution in the Florideophyceae. Fredericq, S., J.N. Norris, E.A. Zimmer, D.W. Freshwater and M.H. Hommersand. 1996. Proposal of the Dumontiales ord. nov. and reinstatement of the Sphaerococcales Sjoestedt emend. based on family complexes previously placed in the marine red algal order Gigartinales. J. Phycol. 32(3)suppl.:16. Freshwater, D.W., S. Fredericq, B.S. Butler, M.H. Hommersand and M.W. Chase 1994. A gene phylogeny of the red algae (Rhodophyta) based on plastid rbcL. Proc. Natl. Acad. Sci. USA 91:7281-7285. Gabrielson, P.W. and D.J. Garbary. 1985. Systematics of red algae (Rhodophyta). CRC crit. Rev. Plant Sci. 3:325-366. Gabrielson, P.W. and D.J. Garbary. 1987. A cladistic analysis of Rhodophyta: Florideophycidean orders. Br. Phycol. J. 22:125-138. Garbary, D.J. and P.W. Gabrielson. 1990. Taxonomy and evolution. Pages 477-498 in Biology of the red algae (K.M. Cole and R.G. Sheath, eds.). Cambridge University Press, Cambridge. Pueschel, C.M. 1994. Systematic significance of the absence of pit-plug cap membranes in the Batrachospermales (Rhodophyta). J. Phycol. 30:310-315. Pueschel, C.M. and K.M. Cole. 1982. Rhodophycean pit plugs: an ultrastructural survey with taxonomic implications. Am. J. Bot. 69:703-720. Saunders, G.W. and G.T. Kraft. 1994. Small-subunit rRNA gene sequences from representatives of selected families of the Gigartinales and Rhodymeniales (Rhodophyta). 1. Evidence for the Plocamiales ord. nov. Can. J. Bot. 72:1250-1263. Saunders, G.W. and G.T. Kraft. 1996. Small-subunit rRNA gene sequences from representatives of selected families of the Gigartinales and Rhodymeniales (Rhodophyta). 1. Evidence for the Halymeniales ord. nov. Can. J. Bot. 74:694-707. Saunders, G.W. and G.T. Kraft. 1997. 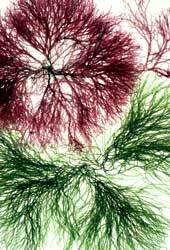 A molecular perspective on red algal evolution: Focus on the Florideophycidae. Pages 115-138 in The origins of algae and their plastids (D. Bhattacharya, ed.). Pl. Syst. Evol. Suppl. 11. Saunders, G.W. and J.C. Bailey. 1997. Phylogenesis of pit-plug-associated features in the Rhodophyta: inferences from molecular systematic data. Can. J. Bot. 75:1436-1447. 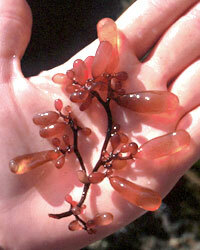 Introduction to Coralline Algae. Derek Keats, University of the Western Cape, Bellville (Cape Town), South Africa. Fossil Coralline Algae. Michael Rasser. University of Graz, Austria. Polysiphonia. Micscape Magazine article by Jan Parmentier. Batrachospermum. Micscape Magazine article by Gary Baird. Grown in the tank culture facility at Harbor Branch Oceanographic Institute, Florida, USA. The author wishes to thank G. W. Saunders for helpful comments, K.T. Bird, D. F. Kapraun, C. M. Pueschel and J.L. Woodhead for photos, and Katja-Sabine Schulz for invaluable help with the building of this page. Support for this page was provided in part by the National Science Foundation. Page: Tree of Life Florideophyceae. Authored by D. Wilson Freshwater. The TEXT of this page is licensed under the Creative Commons Attribution License - Version 3.0. Note that images and other media featured on this page are each governed by their own license, and they may or may not be available for reuse. Click on an image or a media link to access the media data window, which provides the relevant licensing information. For the general terms and conditions of ToL material reuse and redistribution, please see the Tree of Life Copyright Policies.